Ever since I broke the ring finger on my left hand, I haven’t been able to wear my wedding ring on that hand; the knuckle on the finger is just too swollen. (In fact, I had taken to wearing the ring on my right hand; is that some kind of social signifier?) Yesterday, though, I happened to be passing the jewelry district on 47th Street, so I thought I’d look into my options. I know jewelers can "stretch" rings a bit to make them a little bigger. Well, the difference in my ring size on that hand was way too much for stretching — thanks to the break, it went from a size 7 to a size 10! The only option was to cut the ring and add some gold to fill in the extra size. And that’s what I had them do. I have to say the jeweler (a nice elderly man originally from Istanbul) did an amazing job: he matched the design of my vintage ring so well I can barely tell which is the new part. And all in about two hours! I try not to get overly sentimental about many things, but it really means a lot to me — and, it turns out, to Sari — that I can now properly wear my wedding ring. It’s been almost four years — Welcome back, ringy! That’s great! I remember I got into a little scooter accident during our honeymoon which required me to wear my ring on the right hand. Up until that point I didn’t realize how important it was to me. Maybe it’s the tradition talking… but having worked so hard to wear that ring… it just feels right to wear on the left. I didn’t break anything (lucky). When I fell off the scooter the ring actually gouged me around the knuckle and between the fingers (still have a scar there… my little reminder to not go scootering by myself). At any rate it stayed swollen for a little over a week… and I was able to wear the ring after that despite the bandage that I still wore on my hand. The other parts of my body took longer to heal, but I didn’t suffer any injuries that required serious medical attention. Just some scrapes and cuts that were fine with the liberal application of bandages and neosporin. 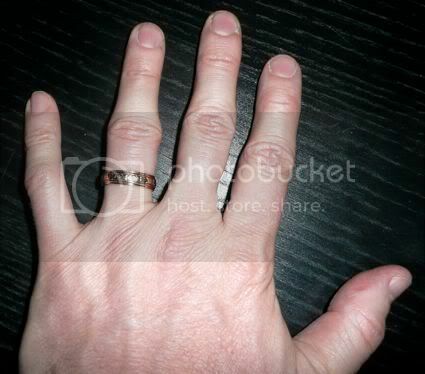 Ring on the right hand means… you were probably married in Europe. I Never take mine off. I know how you feel. For a half size, they can usually whack it on a metal bar to widen it a snidge. Three sizes is a lot. That ring should be there to show you are where you belong.